Research, development and quality assurance play particularly important roles at Wenatex. Each mattress is subjected to the Wenatex quality test. In the company’s own research, development and production facility in Ranshofen (Upper Austria), experts work nonstop to ensure the continuous further development of the Wenatex Sleep System. Wenatex customers can rest assured that all of the products meet the highest quality standards – this is guaranteed by regularly performed Wenatex Tests. The products are regularly tested by independent testing institutes, such as the TÜV Technical Control Board, the LGA State Trade Agency or the ÖTI Institute for Ecology, Technology and Innovation, with regard to the material content, material quality, workmanship, durability and loading capacity. Numerous quality certificates confirm the high quality standards of Wenatex mattresses, pillows, duvets and bed inserts. Wenatex-internal control process on two levels additionally ensures that each individual product meets the high demands pertaining to orthopaedic mattresses. After production, each mattress is subjected to a test to determine the support point elasticity and compression hardness. Only products that pass this quality test are subsequently offered for sale. Individual mattresses are taken from the production line and subjected to additional tests regarding their long-term durability and loading capacity. 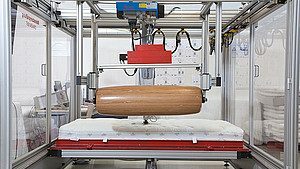 Wenatex has its own mattress testing machine, which is also used for testing purposes by renowned institutes, such as the TÜV Technical Control Board, the LGA State Trade Agency, or the Holzforschung Austria Wood Research Institute. “These tests provide us with valuable information, which can then be incorporated in the further development of our products.” explains Michael Wernicke.Success proves Wenatex right: Over 1 million customers already trust in Wenatex quality and give the products top grades. A current GfK study shows that 99 % of customers are satisfied with the purchased products.